I was "surfing" today and came across your web site, and a picture of your skillfully constructed "Atomic Annie"... as we so called these huge 280 mm dinosaurs. I served with the 663 rd. 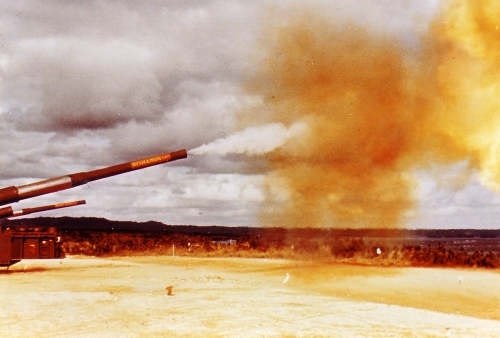 Field Artillery Battalion on Okinawa in the mid 1950's. We had three batteries of two guns each. To the best of my knowledge there was no permanent deployment of the weapon to South Korea, although we did load them up on LCM's on Okinawa, and took ferry rides to Korea and Formosa to demonstrate our flexibility and mobility. We were limited to only the roads available for deployment and not much had been rebuilt since the end of World War Two in 1945. Okinawa had one main highway going from the port in Naha to Kadena AFB and that's about it. We used three radar units to track the shells and where they landed in the East China sea, since binoculars were a strain at 35 miles!!! The Air Force and the Navy would try to keep local fishing boats and commercial vessels out of the area during our firing missions. However, rumor has it we may have sunk a couple of Chinese (pretending to be fishing) vessels but who knows and it makes a great story of "intrigue." We fired from two old Japanese air bases, one at Yontan and one at Yanaberu, due to the fact that the concrete runways could handle the weight. 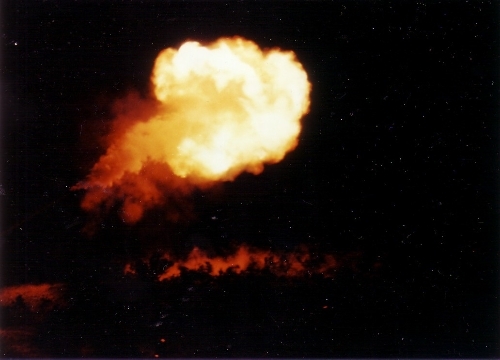 Once we had a "SHORT ROUND" which only went out about a thousand yards: a conventional shell weighing 900 lbs of "High Explosive"... and hit the East China Sea... it rained coral, sea weed, dead fish and sea life and the smelliest sea mud ever, this went on for what seemed to be five full minutes. "I graduated from Colorado A&M and went on active duty, enrolling in the basic artillery course at Ft. Sill, OK in January 1954, as a Reserve 2nd Lt. Then, I took a thirty day leave and went to Holyoke, Colorado to convince my college girl friend, Janet, to marry me. After a short honeymoon, Jan stayed behind and I traveled to my first assignment with the 287th FA Bn stationed in Dachau, Germany, the concentration camp during the war. It had not changed much from that time, but was now filled with Displaced Persons (DPs) from all over Europe. They lived in the same buildings used by the prisoners - and had built a makeshift church out of tin cans. I remember nights on duty in the guard towers that surrounded the camp - and how eerie it felt to be there. We had a small firing range outside the camp we used to keep qualified, and when the mess personnel would bring out our meals - there were always five or six displace people standing at the end of the line near the garbage cans. We helped however we could, but this was very sad to witness. Then I received my Regular Commission and was transferred to Heilbronn, Germany with the 867th FA Bn, a 280mm Field Artillery (Atomic Cannon) Battalion. These big heavy guns could shoot an atomic round 20-25 miles - and were mounted on a huge carriage unit that was pushed and pulled at the same time by two trucks at each end. While out on maneuvers, the two drivers would have to communicate with each other constantly to get through the narrow streets and traffic. But sometimes we would cut it too close and take a little corner off buildings. We actually had a special unit that went ahead of us to test whether the bridges could handle the our weight. The Russians weren't allowed to be in our area, but every once in a while we would spot a sedan of Russian military - and we'd have to call the MP's. This was the time when you never knew if and when the Russians were going to attack. I bought a used car after Jan joined me in Germany, and was surprised to be handed a pack of papers when I picked up the license plates. When I opened the envelope I found some maps and instructions for Jan - in case the Russians invaded, she was to take our newborn son and another wife with her - and drive the car to the coast for evacuation. With the amount of atomic weapons targeting that area, most of Germany, including my unit, probably would not have survived if the Russians had attacked - and we'd actually had to use those big guns." Lt. Col. Hubp was again in Dachau from 1964 to 1966 with the 3rd Bn 37th FA.